Check this post for updated Cebu Pacific Baggage Fees 2019! Aside from buying ticket during Cebu Pacific seat sale to save on travel cost, you may also purchase Prepaid Baggage Allowance to save on baggage fees. Baggage allowance rates differ when you buy it during Initial Booking, Manage Booking or at the airport when you check in for your flight. 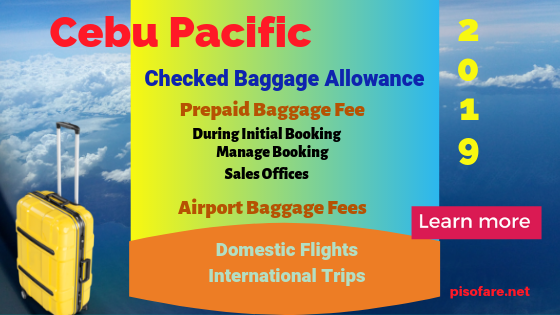 Get the cheapest baggage fee when you book your baggage during initial booking. Not sure of the weight of your baggage? No worry, you may purchase Prepaid Baggage Allowance up to 4 hours before flight departure. Only one prepaid baggage option is allowed per passenger per sector. Flights to destinations in which travel time is 6 hours or less like Hong Kong, Singapore, Japan, Brunei and other Asian countries. Any additional weight in excess of the purchased prepaid baggage weight shall be paid as standard excess baggage rate. Prepaid baggage rates are re-booked and upgraded but are non-reroutable or non-refundable. Prepaid baggage fee may not be stored in a Travel Fund. Thru “Manage Booking” tab of Cebu Pacific booking website: www.cebupacificair.com up to 4 hours before flight departure. Contact Cebu Pacific Reservation hotlines (up to 4 hours prior to flight take-off). You may also purchase Prepaid Checked Baggage Allowance by visiting any Cebu Pacific Sales Offices up to 4 hours before scheduled departure. Checked baggage allowance can be paid by: Credit Card, Debit Card or thru Payment Centers or in Cash at Cebu Pacific sales offices. For flights leaving in 4 hours, it is best to pay your Prepaid Baggage Allowance in the airline’s sales offices. Upgrading baggage allowance may be also done via Manage Booking, calling the airline Reservation Hotline Numbers or going directly to Cebu Pacific ticket offices. Take note that maximum checked baggage allowance for DG flights is only 20 kilos. Interested to receive more travel tips and information? Like and Follow our Facebook: PISO FARE TICKET!